Welcome to December and today I thought I would share this winter shadow box for my DT contribution for Rachel's 'Create a Scene' theme, it was the project we made on the last workshop we held for the year back in early November. I thoroughly enjoyed designing and teaching this box with all the techniques and 3d elements that are included. If you look into the background you will see it is textured, crackled and glittered to create that wonderful icy look, even that beautiful regal stag was inked and covered with rock candy distress glitter to make him sparkle, albeit in a rather understated way. 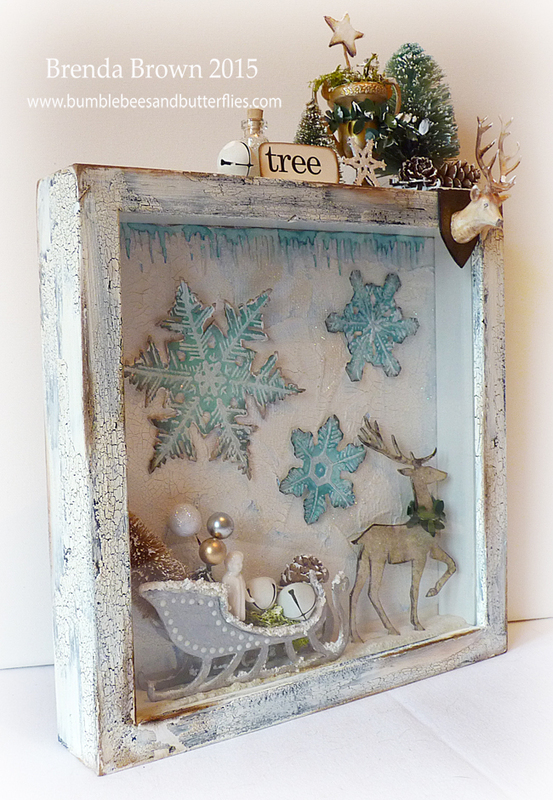 Tim's sleigh die has been used to make a three dimensional carriage for the little collection of goodies inside and the snowflakes are also Tim's and they have been inked, given a coat of gesso and more distress glitter added to them. You can see in the photo above that the frame has been layered and crackled and then distressed to give it an aged look. The bottle bruh trees have been sprayed, the trophy cup painted and filled with moss and a glittering star and a few other items added to build another little scene. 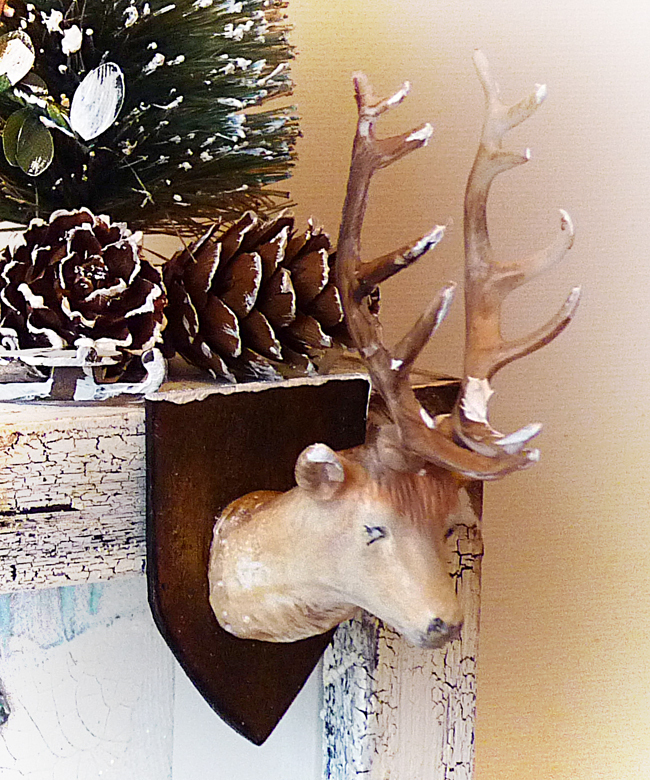 The stag's head was painted using decoart media fluid acrylic paints and some gesso added to create snow. He was mounted on a board which is a piece of greyboard die-cut and painted to look like a varnished piece of wood. Now I would like it to snow over the Christmas holiday so that the grandchildren can have some fun on their toboggans and enjoy the winter as it should be enjoyed by youngsters. I know it's not so much fun for us oldies but I still feel the magic when the snow begins to fall, there is something so special when the world turns white. Do pop over to the CVCC blog to see what other wonderful projects the team have come up with and have a great week. 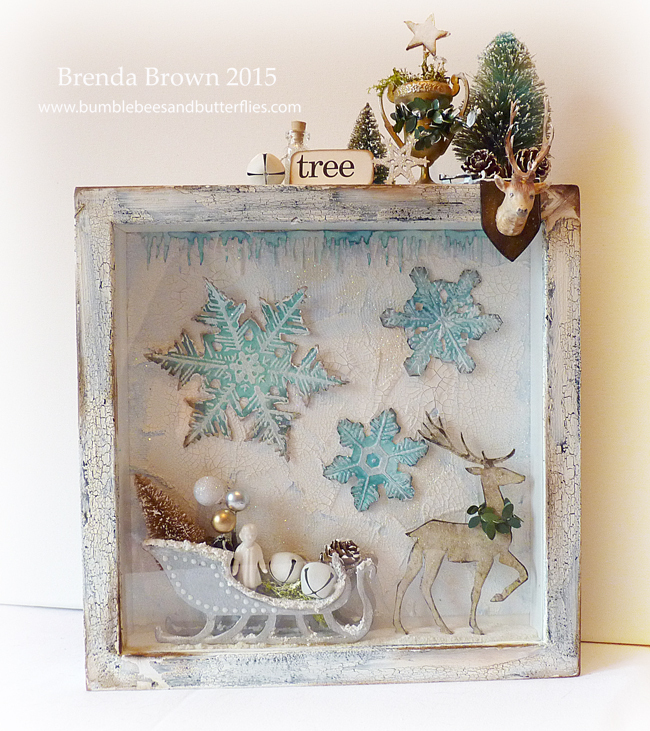 Wow Brenda, your vintage shadow box is fabulous! 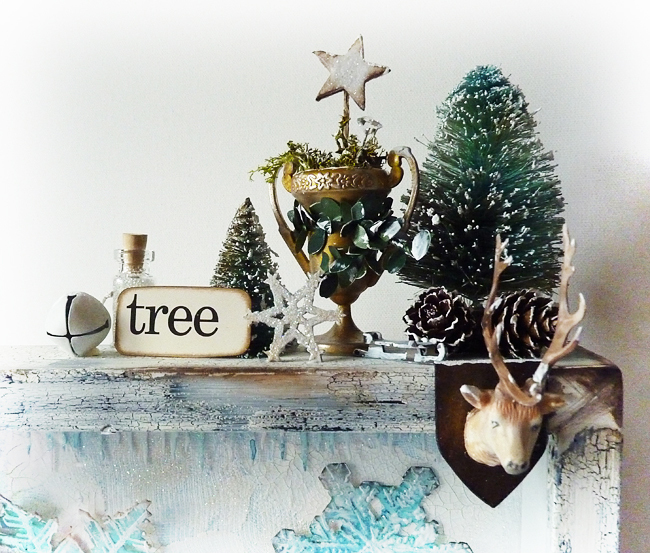 My favourites are the icicles! So pretty, Brenda. I love the snowy white mixed with the touches of light blue. Gives a real vintage feeling. You did a beautiful job on this scene. Fantastic scene you've created here, Brenda! Perfectly designed (at least to my taste) and wonderful winter scene! So awesome! I like the distressed frame and all the nice details! How much fun I know you had putting this together! 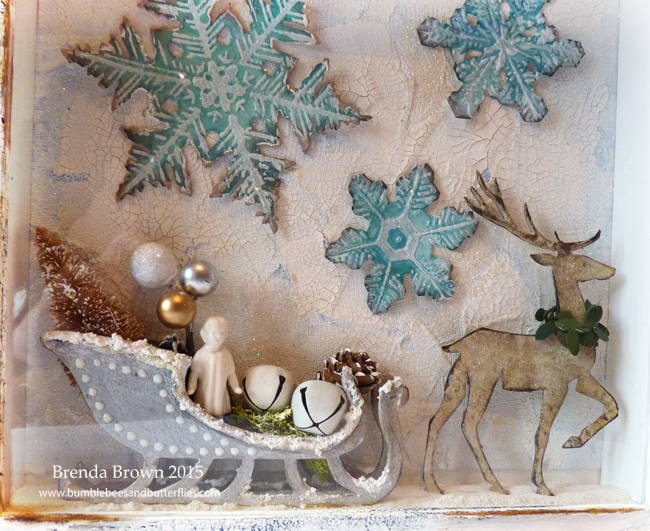 Brenda, I just love your shadow box filled with winter delights! Gorgeous crackle and details! Hope all is well! Hugs! Holy cow...I mean deer...your deer looks so real...FABULOUS! LOVE the top side decor too. Wonderful project! Absolutely brilliant! Having had the privilege of seeing this in real life, I know just how jaw-droppingly gorgeous it is with all that lovely crackle and fabulous paintwork to bring the deer to life (almost!). I'm now on the hunt for the sleigh, thanks to you! Fabulous work. This is fabulous. There is so much to look at ! We just added another deer to our walls here at the ranch over Thanksgiving so when I saw yours - I thought - wow - that looks so realistic!!! This is amazing Brenda. That sleigh is wonderful. And hearing you talk about the kids on toboggans - dear me - I don't even know how to spell that word - we don't have them here and if we did - they would be sleds!! I love your winter scene - it's beautiful - but don't envy you the snow!!!!!!!!!!!!!!!! Loved seeing your incredible creation - you are just soooooooooooo talented. Hugs. j.
Brenda you created a fabulous piece of art. I love what you made. The crackle, the top of the shadow box is so full of lovely stuff.. You are such a talented srtist.